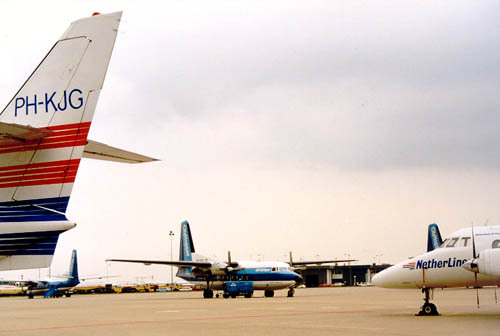 The early 1990s saw 2 struggling regionals in Holland: Netherlines and KLM's "Cityhopper" NLM. This photo was taken in 1988, both still in fierce competition. In 1990 Netherlines capitulated and merged with NLM and by 1992 both were integrated in KLM's network under a new brand: KLM Cityhopper (KLC). 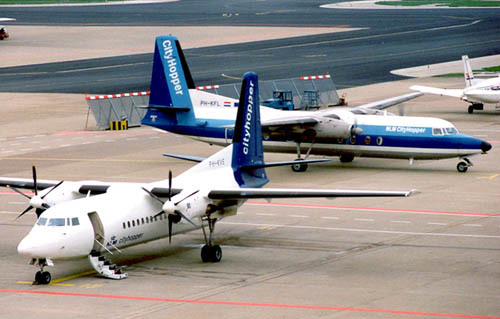 The KLC flew at that time 3 types of aircraft: Saab 340B (33 seats), Fokker 50 (50 seats) and Fokker F-28 (80 seats). NLM's F-28-4000 "Fellowship" PH-CHD (c/n 11139) is seen here at Schiphol. Martinair has had a long relationship with KLM's Cityhoppers, due to a maintenance contract. Towing and the supply of groundpowers are also part of the deal. This photo was taken in the 1980s. NLM lives on in the identity of Fokker F.27 PH-FHF, a Fokker Friendship previously know as VH-NLS of Aircruising Australia and restored by Fokker Heritage Trust.